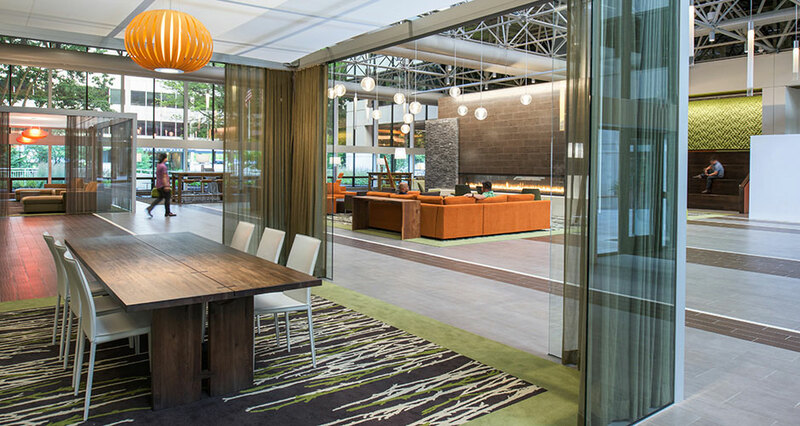 Located in Portland’s SoMa (South of Market) EcoDistrict, The 100 at Park Square draws inspiration from its downtown Portland location and creates unique amenities for tenants and visitors. 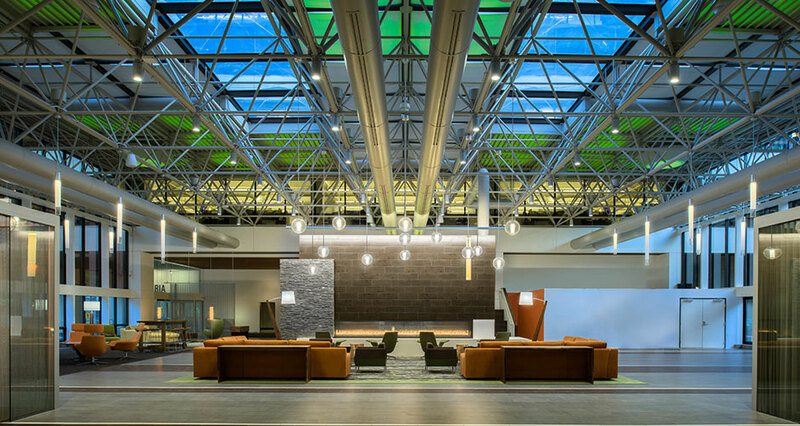 Mackenzie was tasked with designing a multifunctional, hospitality-like space that accommodates office employees, visitors, and the public. 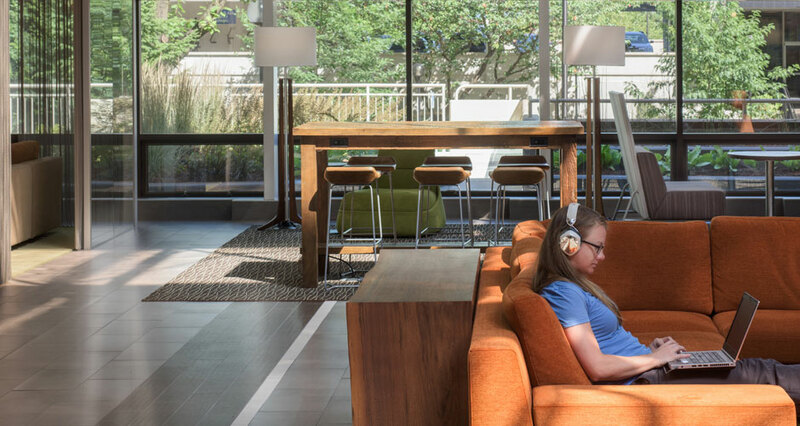 The Great Room, which serves as the main lobby, and the patio spaces are extensions of the building’s offices and form a dynamic space for working, collaborating, relaxing, and socializing. 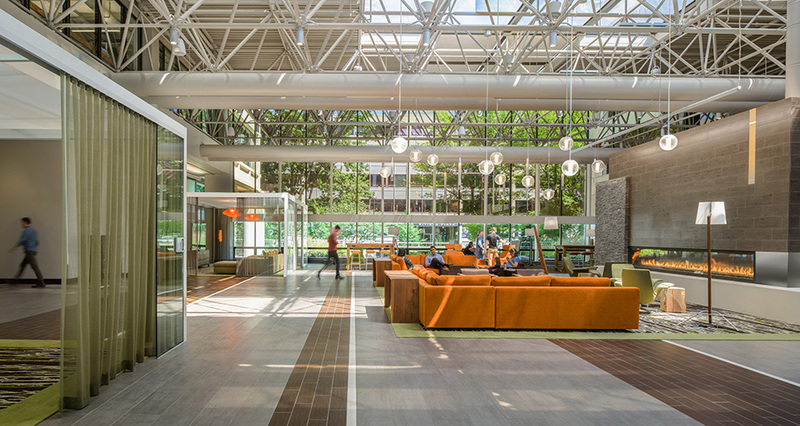 Mackenzie provided architectural, structural, interiors, and landscaping services for this unique 12,232 SF flexible space, which serves the dual purpose as the building’s living room and work/play space. The outdoor landscaping incorporates native plants and charcoal colored planters to create a natural and inviting entrance. The central lobby evokes a modern, sleek and inviting look with beautiful, reclaimed wood inlaid into the front reception counter. 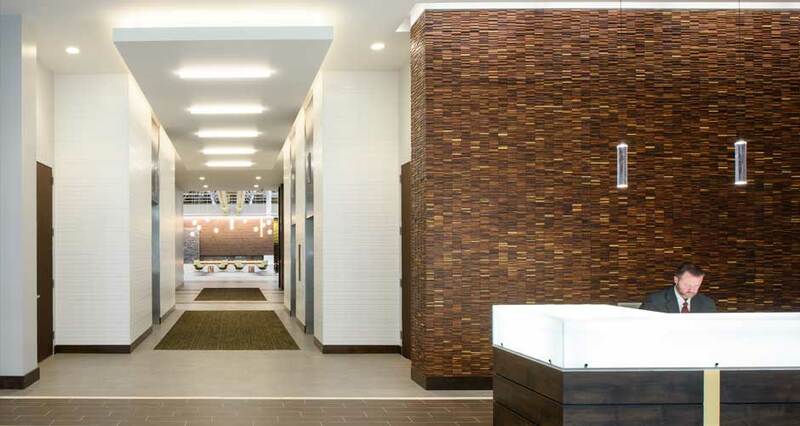 Modern porcelain tile and ceiling lights lead visitors from the lobby towards the Great Room. 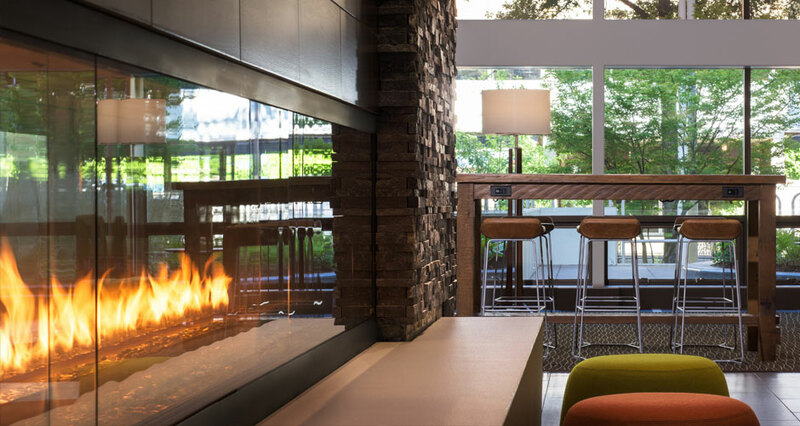 The focal point of the Great Room is a contemporary, slate and porcelain fireplace. This is complimented by stadium seating, located at the south end of this light filled room, which can be used for presentations, conferences, or lounging. 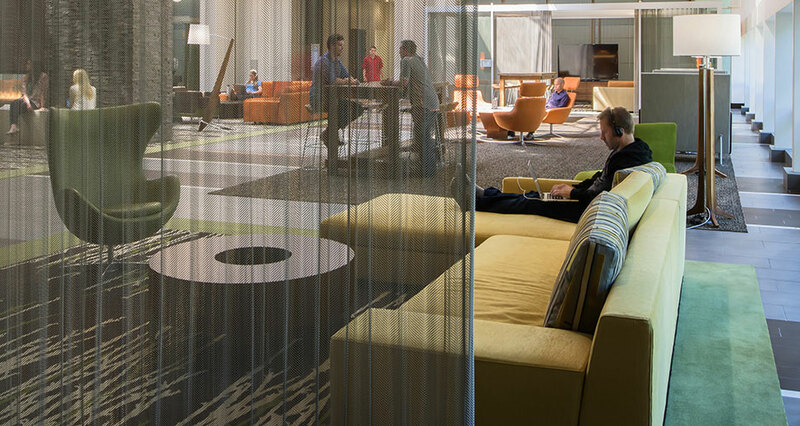 The floors are covered with earthy linear carpet with textural organic tree themes. The room features multiple cabanas with movable curtains to allow for spontaneous, semi-private places for business meetings. 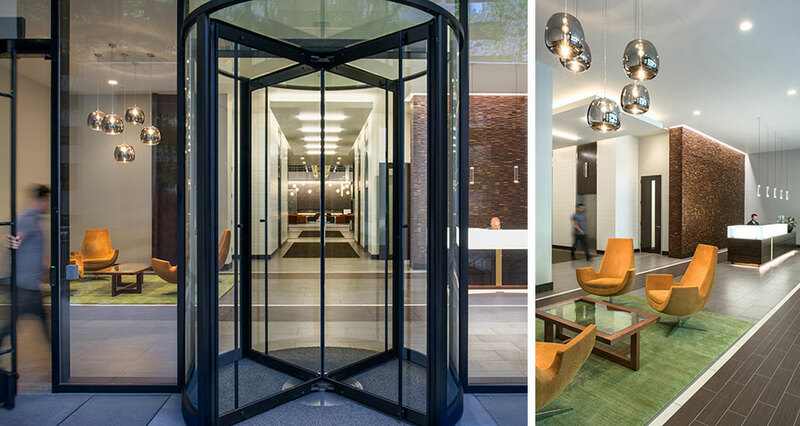 The space is also equipped with large, floor to ceiling windows, dynamic lighting systems, energy consumption monitoring, and touch screen controls to take advantage of both natural and artificial light. 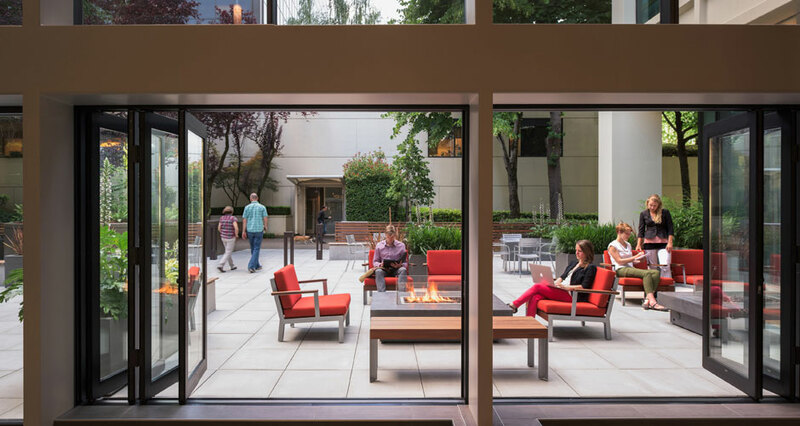 An outdoor patio, which is adjacent to the historic Halprin pedestrian walkway, creates an informal entrance through the glass doors directly into the Great Room. 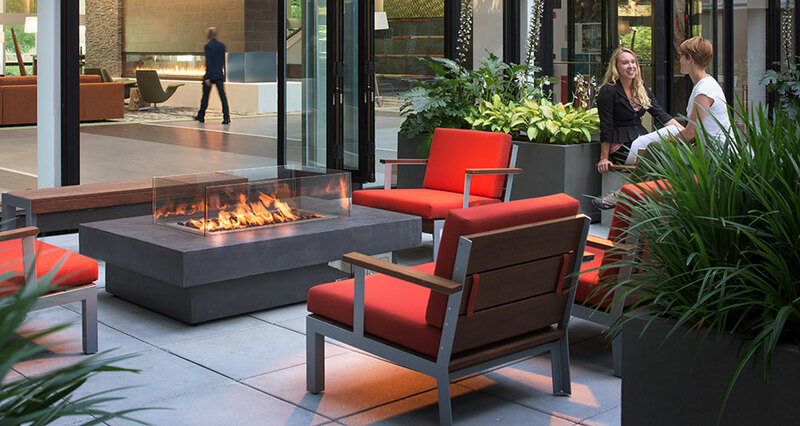 The patios, small fireplaces, wood fences, benches, and serene landscaping create a fun and exciting social atmosphere. 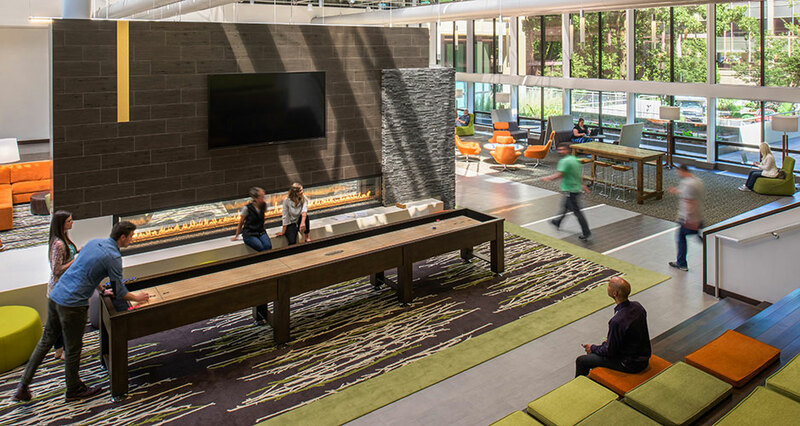 The combination of indoor/outdoor space creates unique environments to hold public events, presentations, and office parties in a natural setting.